Food is the common denominator at the best holiday gatherings. Setting a beautiful table in your Springs luxury apartment home adds to the festive ambiance and actually makes the food taste even better. Whether you're entertaining friends or enjoying an intimate family meal, use these table-setting tips to enhance your dining experience during the holidays or anytime of the year. Don't just throw any basic tablecloth down and call it a day. Table coverings literally form the foundation for your setting, so use them to establish the look you want to create. If you want to show off the dining table, a table runner is a great option that can also be used with a tablecloth for a layering effect. Can't find what you're looking for? DIY table linens are surprisingly easy to make. Paper napkins are generic and bad for the environment. 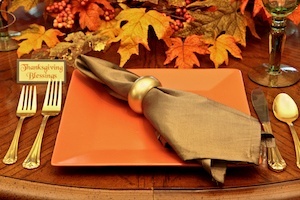 Even if you're going casual, cloth napkins add a gracious note and provide another valuable piece of your decor. And let's face it, paper napkins are a lot messier than cloth napkins. Placemats are nice, but charger plates are a fun way to accent place settings. Chargers are large plates that don't hold food. Instead, they act as a base for the serving dishes and provide a border that sets them off. Charger plates come in a wide variety of materials, ranging from acrylics to stainless steel. As with table coverings, you can also customize your own or use alternative options such as doilies. If you want something outside the box, consider novelties like tiles or slabs of wood. Gone are the days when a good hostess wouldn't dream of putting out table settings that didn't match. Mix 'n' match place settings make a style statement all their own. Try pairing rustic and vintage, experimenting with color palettes or combining different flatware patterns. A centerpiece serves as the focal point of your table, tying together all the elements of your look. Less is more is a good rule to apply. Simple arrangements are usually more visually appealing, and you don't want anything that may interfere with conversation. Candles serve double duty as decorative and lighting elements. Candlelight is more flattering and appealing than harsh overhead lighting. Be sure to use unscented candles that won't clash with the delicious aromas of your meal. Incorporating small decorative items or souvenirs for your guests shows that you cared enough to go the extra mile. Place cards are a classic choice, but other ideas include seasonal decorations, unusual napkin rings or mini-flower vases. What one item is always on your dinner table? Let us know in the comments!